Once you install and activate our plugin successfully, you should see a new “Password Protection” column under all Pages & Posts. Simply click on “Password protect” and then “Password protect this page” under popup to protect your private content. Our plugin will auto-generate a new password after protection. You can create and customize as many passwords as you want. The password created by this method is categorized as Global (custom), which means that anyone can use it to access your protected page. 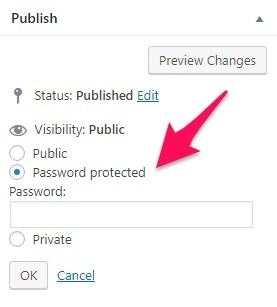 Besides password protecting by our plugin, you can still use the “Password Protected” feature of WordPress. 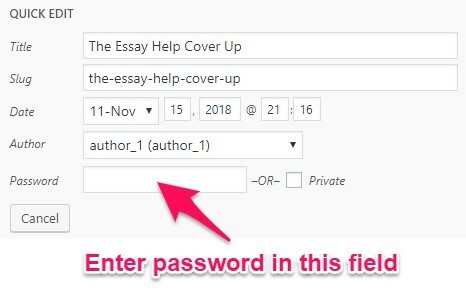 Alternatively, click Quick Edit under page’s title to add a new password. Please note that this method just allows you to create one password which applies to all visitors and users of your website. It is categorized as Global (default) to differentiate from Global (custom) password generated by our plugin. If you want to grant access to certain user roles, you have a choice to create passwords for only these groups of people. No one without the right role is able to access your content even though they have the right password. You will see Password protected by option under the Publish section in the right sidebar of the Edit page. Simply choose a user role and then create a specific password for them. Click “Save” to update the change. 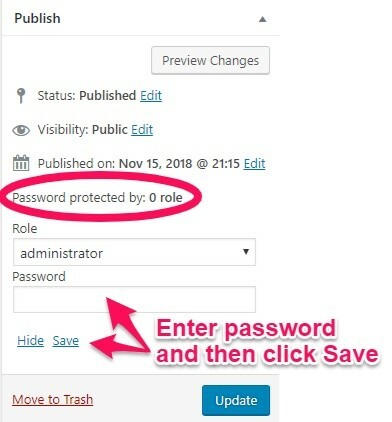 You can still set passwords for other user roles without having to refresh the page. This option allows you to protect multiple pages and posts simultaneously with the same password, which is categorized as Global (shared). You can enable it under our plugin’s Settings page. Protecting a parent page will auto-protect all its child pages. Protecting a category will auto-protect all posts under it.